There is little I love more than a charm bracelet; which, as you may have guessed, should come as no surprise given the fact that such an accessory is made with one thing in mind…charming the wearer. After all, who can resist the subtle tinkling sound that such a bauble creates; or the ability to establish memories with each new charm added to your collection? No one, that’s who. Now, thanks to Cutey, one (1) fabulous fashionista will have the chance to take home a sparkling charming bracelet all her own – of her choosing! That’s right, my loves! 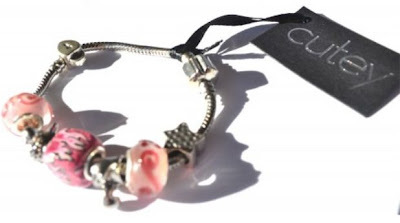 Café Fashionista has teamed up with Cutey, a new online retailer of charm bracelets, to bring one (1) lucky lady the Cutey charm bracelet of her choice! ♥Visit Cutey and select your favorite charm bracelet. 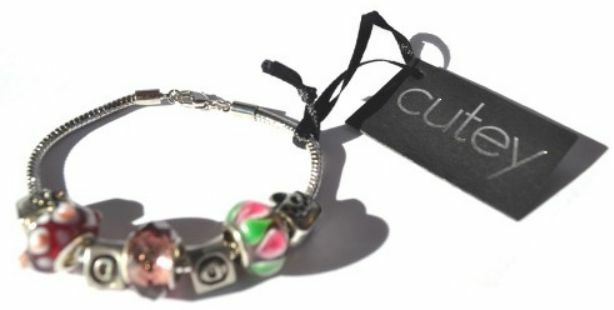 ♥For one (1) entry, leave a comment on this post stating which Cutey charm bracelet is your favorite between now and Friday, January 6, 2012 at midnight PST. ♥For two (2) entries, Tweet about this giveaway, and leave a comment on this post stating which Cutey charm bracelet is your favorite between now and Friday, January 6, 2012 at midnight PST with your Twitter URL. ♥For three (3) entries, become a follower of Café Fashionista on Blogger/Google Reader/Google Friend Connect, or Twitter @cafefashionista, and leave a comment on this post stating which Cutey charm bracelet is your favorite between now and Friday, January 6, 2012 at midnight PST (if you are already a Café Fashionista follower, please say so in your comment). I will randomly pick one (1) name out of a hat (who knows, it could be yours! ), and announce the winner on Saturday, January 7, 2012. Thanks to Cutey for the pictures. So adorable. I'm smitten with the Oneiroi bracelet! Oh so lovely! Great giveaway! I have my eye on the Tartarus bracelet. I love the heart in the oizys bracelet. Great giveaway! Oh, so lovely. I love this first pic that you posted, but I think its out of stock. This is such a fun giveaway. What a treasure. LOVE the Momus! Bright pink and lime green is one of my favorite color combos! i follow your blog everywhere. i follow Cutey on twitter as well. my fave item: the OIZYS charm bracelet! I really love the Eris bracelet. It has the key to my heart. Also grown-up Christmases are a lot more fun at times. It certainly helped my Christmas spirit. You continue to find the most amazing stores/hold the most amazing giveaways of anyone in the blogosphere. The Moirae is my favorite. I hope you have an amazing holiday! To you and yours, I want to make sure that I wish you a very Happy Holiday! Momus is my favorite! Merry Christmas! Love the Tartarus bracelet! The colours are really nice. I like the Hypnos bracelet. They are all so cute! I love the Momus one. Thanks and happy new year! Oneiroi is so funky and cool. I like the Philotes bracelet. wow, i love them all, but i really like the Apate one! I like Typhon but it is out of stock, so a close second is Hypnos bracelet. Jordan T.
This is a GREAT giveaway! All of the bracelets are lovely; however the Typhon bracelet is my favorite! Thanks! Jessica P.
My favorite one is momus!! and my favorite is still momus!! I like Hypnos Charm Bracelet. My favorite is the Tartarus! I love the Gaia bracelet! I follow Cafe Fashionista on twitter @AMLewis2003. I follow Cutey Jewellery on twitter @AMLewis2003.